This book is dear to Louise’s great heart. Here, in Gratitude, she has gathered the insights and collected wisdom of some of the most wonderful teachers and writers she knows, people who have demonstrated the power of gratitude in their own lives. 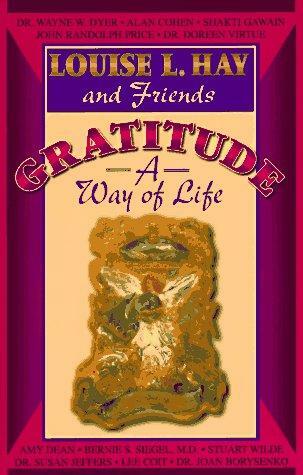 It includes contributions from Wayne Dyer, Joan Borysenko, Dan Millman, Harold Bloomfield, Bernie Siegel, Shakti Gawain, Doreen Virtue, and many more of her friends, as they share their understanding of the practice of gratefulness with Louise... and with readers of this book. All of the proceeds generated from this book will benefit Louise Hay’s nonprofit charity, The Hay Foundation, which works to improve the quality of life for many people, including those with AIDS, and battered women. This inspirational book will help you understand the importance of gratitude—and benefit some hurting people at the same time. A positive result of being grateful for your world is your increased capacity to give. When you have gratitude in your heart, you will find a new willingness to give to others so that they, too, might experience the joys that you feel. You will find that you will want to contribute to the needs and wants of others without any expectation of acknowledgment. Some other works by Louise Hay are You Can Heal Your Life and Heal Your Body. Louise Hay has gathered the insights and collected wisdom of some of the most wonderful teachers and writers she knows, including Dr. Wayne W. Dyer, Dr. Joan Borysenko, Dan Millman, Harold Bloomfield, Dr. Bernie Siegel, and Shakti Gawain, who share with Louise and her readers their understanding of the practice of gratitude.